Price charts don’t progress linearly. They rise or fall in waves. In an uptrend the upward move is bigger than the downward and in a downtrend the downward move is bigger than the upward. Price moves contrary to the main trend are called corrections. So in uptrends we have downward corrections and in downtrends we have upward corrections. But why prices correct before resuming their prior trend? In an uptrend the main reason is that traders or investors are taking profits so they exert selling pressure. Notice at point 2 that price corrects. Presumably, short term traders or long term investors are taking profits by closing their long positions. Maybe a short term trader bought the stock at point 1 and according to their strategy he/she must exit at point 2. An investor also that had bought the same stock before two years he/she decides to exit at point 2 because maybe the company announced earnings that weren’t satisfactory for their strategy or because price reached his/her goal. The selling pressure makes the stock to fall at point 3, but as long as the traders/investors sentiment for the stock remains positive to the upside, the stock resumes its prior trend because many market participants deem the price at point 3 as a good chance for a long entry. This basic procedure constantly repeats itself and forms the waves on a price chart. At point 1 buyers that had long positions decide to sell the stock and also short sellers are opening short positions. The selling pressure is sending price at point 2 where short sellers are taking profits (they are buying the stock to close positions). When a short seller closes his/her position this is called short covering. Short covering is buying pressure which makes price to move upwards. Simultaneously at point 2 short term traders believe that the stock will make an upward move and they can make money by getting in long for a short period of time. 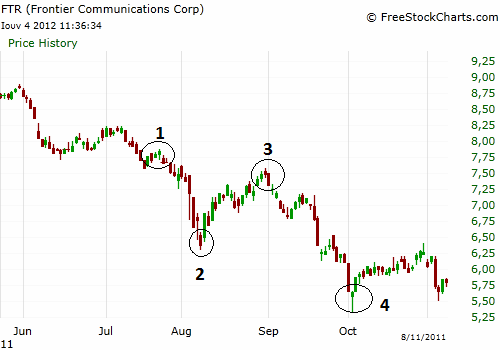 Also at point 2 there may be investors that deem the stock undervalued, so they decide to open long positions. But the fundamentals of the stock and the negative sentiment haven’t changed, so it resumes its downtrend at point 3 after the buying pressure run dry. Particularly, at point 3 we will have again selling pressure from short term traders who got in long at point 2 and now are selling to take profits. 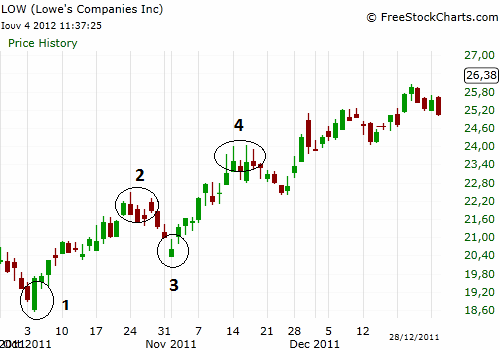 Also short sellers that are watching the stock, open again short positions at point 3 after the upward correction.